I remember the exact day when I became a David Bowie fan. I was 15, it was New Year’s Day, and I was watching Labyrinth for the very first time. I already knew who he was – he was impossible to miss – but until that moment, his genius had somehow passed me by. But since that moment, my life has never been the same. Yesterday, I found out, as did millions of others, that he had left this world and passed into the next. I was high on the music of his latest album, Blackstar, and the second I heard the news, my heart just about broke. As I was replying to a friend, who had mentioned it in a text (unaware that I didn’t already know), I dropped my phone. On retrieving it, I rang her by accident. Shortly afterwards, concerned for me, she rang back, and I had a good cry. She also made me laugh, because that’s what kung fu sisters do. I spent the whole of that morning with my eyes glued to the news. I couldn’t believe he was dead. I still can’t. I’ve cried a lot of tears, adding to the ocean already shed by fans across the world. David Bowie, my creative hero, the consummate artist, has gone to join the Sons of the Silent Age. I saw him play live twice in my life. The first time was in 1990 at the Milton Keynes Bowl. I went with my parents, we were right at the back, it was unbearably hot, but I was there. The second time was the day before my 21st birthday, at Wembley Arena. That was the Outside Tour. Outside remains one of my favourite albums of all time. It was originally meant to be the first of a series of millennium albums, but Bowie having the attention span of a goldfish, once that was done, his focus shifted, and the others were never made. So Outside stands on its own as a piece of music art that requires repeated listening to fully appreciate its brilliance. I once also watched another gig, on a screen in the foyer while he was in the auditorium. It was the Heathen Tour. I may not have been in the room with him, but I count that as the third (and sadly, final) time I saw David Bowie play live. I love many kinds of music, and yet David Bowie remains my one true love. It isn’t just the music. It isn’t just that he was always so devastatingly good-looking. It’s the whole package. Bowie was an innovator, a creator, an artist, a mime, a singer, a songwriter, a producer, a designer, and all sorts of other things that I’ve probably missed out. For several years, I have thought of him as God. I’m not religious, and I don’t believe in God, or any deity as such. But I held him in such high esteem, and always will, that God is the only word I can find that seems appropriate. Labyrinth is still my favourite film. I’ve seen plenty that have blown me away for one reason or another, but it’s only Labyrinth that takes me home. And I mean ‘home’ in a heart sense. Labyrinth reminds me who I was then, who I am now, and who I can be tomorrow if I try. On my birthday in November, I went training, so I celebrated with my SO the day before, instead. And all I wanted was to drink wine and watch Labyrinth, so that was what we did. It was perfect. Now, my heart is bleeding at the loss of such an extraordinary force of nature. I’m proud and privileged to have lived at the same time as David Bowie. He was born about six weeks before my dad, which has always felt a bit strange, as I’ve always found Bowie to be one of the most attractive men on the planet. And I’m drawn to his fierce intelligence, his love of books, his endless curiosity about everything. Those were the things, I believe, which kept him so young for so long. That, and his obvious love for his beautiful wife, Iman. How she must be grieving, now. The other love of my rock musical life, Brian Molko, has expressed his deep grief on the loss of a mentor and friend. He credits Bowie with who he is now, both as a musician and as a person, believing that without Bowie, Placebo would not be where they are now. 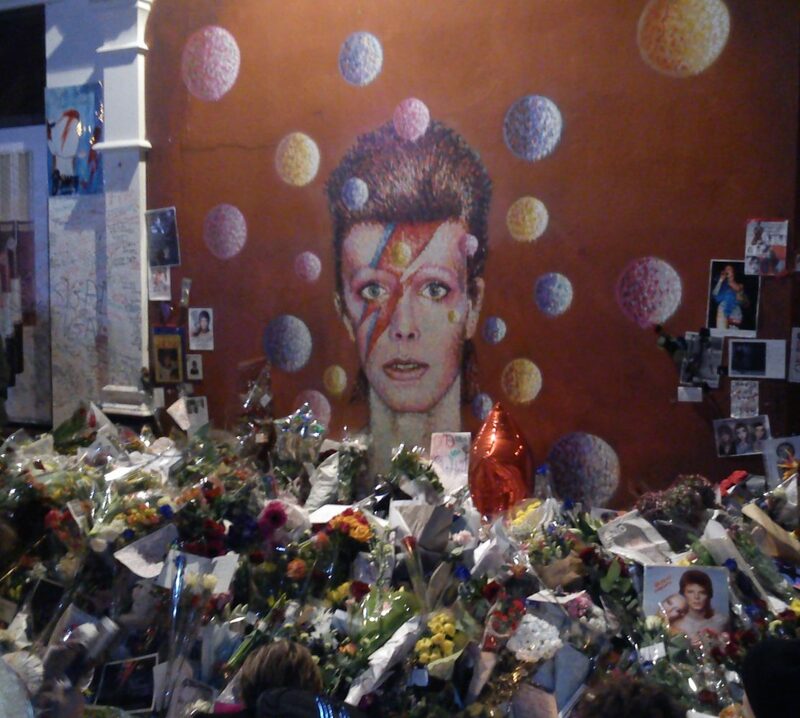 I never had the chance to meet Bowie, and it will always be one of my deepest regrets. I would love to have shared a beer with him and talked about music and books and art. He was funny, articulate and, as far as I can make out, genuine. David Bowie was an artist in the sense that he was into everything. The music made more sense when you added the visuals. The visuals made more sense if you could see the story behind the music. And I’ve always loved a good story. It’s really hard to know what else to say; how else to explain what I feel about him, and why I’m in such deep mourning. I hope that, wherever he is now, he is as free as he always wanted to be. Just like that bluebird.